The fifth annual Cambridge Cardboard Boat Race took place on Sunday afternoon as part of Suicide Sunday post-exam celebrations. 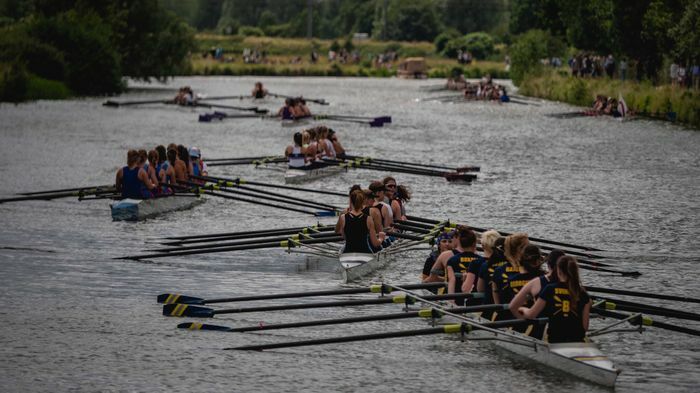 Several hundred spectators, both town and gown, gathered along the banks of the River Cam at Jesus Lock to picnic and drink champagne, making for an eager carnival atmosphere. They cheered on around 30 innovative cardboard craft as students competed to stay afloat and race to collect a “mystery item” from a punt 100 yards upriver before returning to the start. This year, punts were largely manned by volunteers after a clash in the schedule of organizers Granta Rats which threatened to cancel the event. Surely the most significant moment in the Cambridge boating calendar, the competition brief from Granta Rats was to “Build something which (hopefully) floats out of nothing but cardboard, (water-soluble) PVA glue and gaffa tape” and not drown in the process, with the boats resulting from these guidelines differing wildly. From a one-man floating box, to a ten-person, four-metre-high pirate ship that needed a concerted effort from the crowd to hoist it onto the river, all designs showed at least some degree of ingenuity. More importantly, teams also displayed considerable punning prowess, with names like ‘Zero Cardboard Society’, ‘Guardians of Ascard’, and ‘Donald Bump’ abounding. For some, it looked suspiciously as if more time had gone into decoration than practicality; many got creative with cans of spray paint, however one crew opted to use an aggregate of past exam papers as a sail in a telling purge of exam-term misery. Perhaps the most aesthetically pleasing boat was a large rainbow-coloured barque flying the EU flag, however its speedy sinking offered an ominous forecast for Brexit Britain and certainly set the tone for a very soggy day for competitors. This year the rules permitted any means of propulsion, with some teams using sails and the power of the wind (which was blowing in the wrong direction), others using tennis rackets, and still others seeing the irony of paddling with ‘Caution Wet Floor’ signs. Unsurprisingly, it was the teams that employed the time-tested use of actual oars to row that achieved both first and second positions on the day. However, for many mariners water pistols and cans of lager were just as important as oars, be they makeshift or otherwise. In the end it was Alex Watson, Roy Navid, Saim Saeed, and Sam Holdsworth – a team of second-year engineers from Trinity College – who showcased their meticulous design skills and rowed the aptly named ‘HMS Soggy Biscuit’ to victory in what must surely be the pinnacle of their achievements at the University of Cambridge to date. Reflecting on their triumph, Alex Watson revealed the commitment required to come out top dog, telling Varsity that the team had been “planning the boat since last year,” following a calamitous premature sinking in the 2017 event. The ‘Soggy Biscuit’ model was carefully developed in the computer-aided design software AutoCAD and consisted of “99 laser cut sheets of cardboard that slotted together”, using an impressive “102 sheets of cardboard and 11 roles of duct tape”, with construction taking nine hours in total. With around a third of the boats still floating at the finish line, the race quickly descended into a game of bumper boats, much to the gleeful schadenfreude of those watching from the warmth of the bank. Like slightly moist Roman galleys, boats were rammed against the hulls of their rivals, looking to tip those onboard into the icy waters of the Cam. However, more often than not, collisions proved decidedly internecine as the vanquished pulled their vanquishers down with them. Every sinking was accompanied by an increasingly boisterous cheer from the crowd, culminating with a deafening roar upon the toppling of the winning vessel. Teams steadily picked each other off until there was only one left standing and then that too was pulled under the waves by an aggressive band of swimmers. Within 20 minutes of the start, all boats had been sunk and everybody had successfully swum to shore, wrapping themselves in towels. The carnage was over – until next year. Bedraggled boaters piled the remnants of their carefully fashioned crafts into the backs of rubbish trucks under the supervision of members of Cambridge Council before heading home for a well-earned cup of tea.